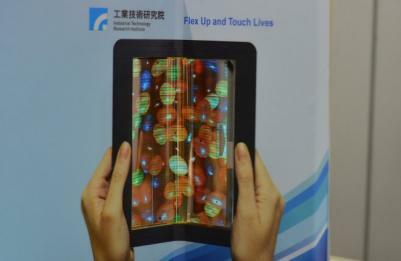 Taiwan's ITRI institute demonstrated several new AMOLED prototypes at Touch Taiwan 2014. First up, is Taiwan's first foldable AMOLED, a 6" full-color panel that can be folded inwards over 10,000 times. The 6" panel can be folded to a radius of 7.5 mm. The whole panel is just 0.1 mm thick and it was developed with ITRI's own FlexUPD technology which can be used to turn an existing OLED glass line to produce polyimide-based flexible panels. This is an improvement from ITRI's previous prototype, a 6" OLED shown in 2010 that had a radius of 5 cm. The current prototype (as you can see in the photo above) still has many defects. 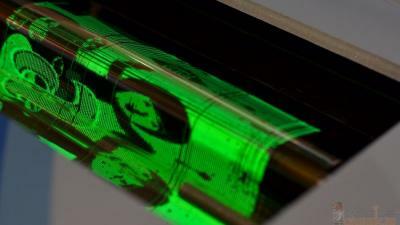 The second prototype is a flexible AMOLED with integrated on-cell capacitive touch. ITRI says that this panel is conformal and unbreakable, suitable for military applications. This is not a foldable display. The final AMOLED prototype is a monochrome panel that can be tri-folded both in-wards and outwards. The specific prototype integrates ITRI's "PI barrier" technology. This is the first time I hear about ITRI's encapsulation technology.